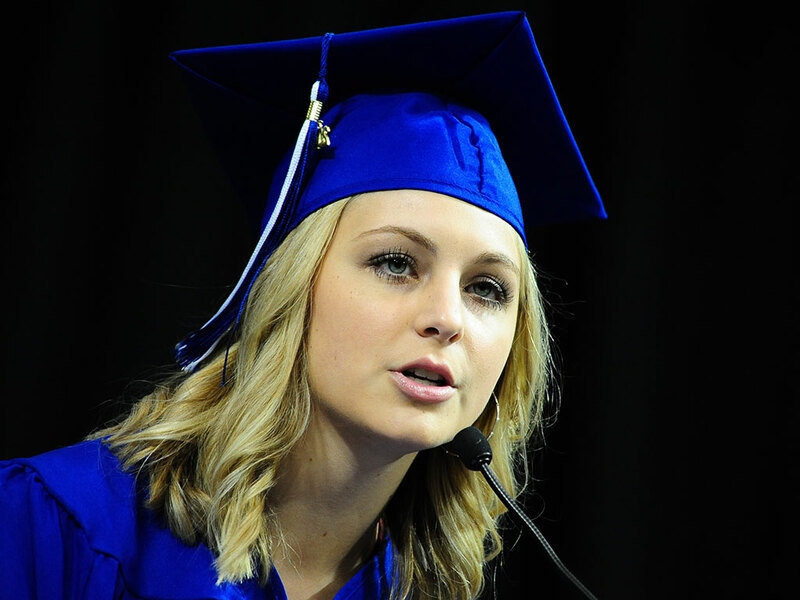 Mattie Jacobsen, who received one of nearly 1,500 scholarship awards from Kirkwood, speaks to fellow graduates at the 2016 Kirkwood Community College commencement ceremony. CEDAR RAPIDS, Iowa (February 9, 2017)-Kirkwood Community College is the number two college in the nation when it comes to percentage of charitable contributions spent on financial aid according to data released this week by the Council for Aid to Education (CAE), a group that gathers data on college donations and financial aid. According to the data, which was taken from the annual CAE Voluntary Support of Education Survey, Kirkwood used 79.7 percent of all donations to the college in fiscal year 2016 on financial aid for students. The college uses the remaining 20.3 percent of donations for other purposes such as supporting academic programs, faculty development and other areas of the college as directed by donors. Kirkwood trails only Broome Community College (N.Y.), which used 86.1 percent of charitable contributions raised for financial aid during that same time frame. According to the CAE, the national average percentage of donations used for financial aid by colleges in FY16 was 16 percent. Kirkwood President Mick Starcevich sees the ranking as a validation of the college’s constant efforts to make college as affordable as possible under his leadership. During Starcevich’s presidency, the total number of scholarship dollars available to students jumped from $740,000 per year to more than $3 million annually. Kirkwood gave nearly 1,500 separate awards to students over the 2015-2016 academic year.